In the Fall of 2010, TLC began airing “Sister Wives,” the first-ever polygamy-friendly reality-TV show. The focus of the series was upon Mormon polygamist Kody Brown, his three wives, and all of their children. By the end of the first season, a fourth wife (with three children of her own) was joining the family too. This family had no connection to crimes, underage marriage, or the FLDS. Indeed, the Browns are a committed family, of whom all 5 of the parents married as un-coerced consenting adults. Soon after the TV series first began, an ominously terrifying “investigation” was announced by the Utah State authorities as a result of the family being publicly “out” as polygamists on television. For their safety, the Brown family quickly moved from Utah to the State of Nevada. Renowned Constitutional Law Professor Jonathan Turley, who had been publicly repeating my known arguments for years (even repeating my pro-polygamy media arguments since 2004) filed a lawsuit for the Brown Family in the Summer of 2011.
the U.S. Federal District Court de-criminalized de facto polygamy in Utah. However, de jure polygamy (having more than one legal marriage license) remained illegal. Eight months later, on August 27, 2014, Judge Waddoups handed down a Memorandum Decision to the Brown v. Buhman case, deciding the seventh and final count. 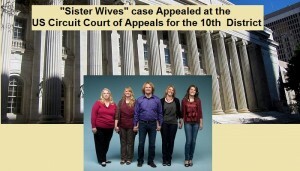 The U.S. Federal District Court awarded damages to the Brown family for Utah violating their rights. Subsequently, Utah appealed that decision at the US Court of Appeals for the Tenth Circuit, outrageously claiming that Warren Jeffs is supposedly “why” polygamy should remain illegal. Such an assertion is beyond outrageous because the nationwide movement of UCAP (unrelated consenting adult polygamy) has vehemently declared how Warren Jeffs was Always Opposed by National Polygamy Movement and that his FLDS was Always Opposed by National Polygamy Movement. We Always Opposed All Criminals. The video of that speech is embedded here below. If so, whether the prosecutorial policy announced in Appellant Buhman’s May 22, 2012 declaration, or any other matters, rendered Appellees’ claims against him moot. These two odd questions are more about the issues of “standing” than they are about the case itself. This could either be worrisome (indicating bad intent) or positive (indicating pre-emptive problem-solving.) The Tenth District’s U.S. Circuit Court of Appeals is the last court to hear the case before possibly proceeding next up to the final court of the Supreme Court of the United States (SCOTUS). Hence, this “next to last court” might be having a recent Decision by SCOTUS “nagging” the back of their mind. Namely, as recently as 2013, SCOTUS vacated the Hollingsworth v. Perry case (instead of deciding it) simply because of the lack of correct “standing” issue. For many, the hope of that decision based “on its merits” potentiated it as a possibly very big case too. Truly, if Hollingsworth had been decided “on its merits” rather than being vacated on the technicality of improper “standing,” it might even have had impact on this Brown v. Buhman case. Instead, Hollingsworth had no positive impact for UCAP polygamy. As such, there is a possibility that the motive behind the Appeals Court asking these two questions is a positive one; it could be that they want to proverbially “dot all the i’s and cross all the t’s” so that SCOTUS will not subsequently vacate this decision too due to the “standing” issue. However, if that is not the intent, then those two questions are worrisome; the questions could otherwise seem to suggest that the court itself is pro-actively looking for ways to intentionally allow such bad law to stay on the books by purposely trying to find such technicalities with which to stop the case at this lower-level court. Regardless of positive or worrisome intent, however, if the issue of “standing” is so positively addressed and resolved, then that will actually strengthen the eventual case for when/if it moves up to SCOTUS. With both sides currently preparing their briefs, the Brown v. Buhman case is scheduled for January 21, 2016, at the U.S. Circuit Court of Appeals for the Tenth District, in Denver, Colorado.